You may have heard that I got a new flatscreen TV for my birthday after waiting (unsuccessfully) for our old tube TV to break. So as soon as we unpacked the box and set it up, I hooked myself up for a free month of Netflix. I learned so much just by watching TV in February! 1. The Walking Dead is on Netflix! 2. Battlestar Galactica is on Netflix! 3. The only way to kill zombies is through the head. 4. The only way to kill Cylons is through the head. 5. Supplies are hard to get after a zombie apocalypse. 6. Supplies are hard to come by after Cylons destroyed human civilization. 7. There are more zombies than humans. 8. There are more Cylons than humans. 9. Zombies freak me out! 10. Cylons really freak me out! 11. Running from zombies ages you. 12. Running from Cylons ages you. 13. Zombies are easy to spot. After all, they’re dead. 15. Unless of course, they are Cylons who look like humans. 16. Zombies’ nicknames are Walkers or Biters. 17. Cylons’ nicknames are Toasters. 18. Bear McCreary wrote the music for The Walking Dead. 19. Bear McCreary wrote the music for Battlestar Galactica. 20. After staying up late watching TV, I can totally survive with only 4 hours of sleep. Yes, I can. Actually I have no right to welcome you because I’m not there…yet. I’d like to be! With less zombies, though. tamaralikecamera recently posted…Adele Dazeem, Or In Other Words, Happy Blogiversary! Welcome, Ginny. You have now completed the first two steps to becoming a Cylon or maybe a zombie. Or just a zombie like creature due to not enough sleep! Your post is really funny. 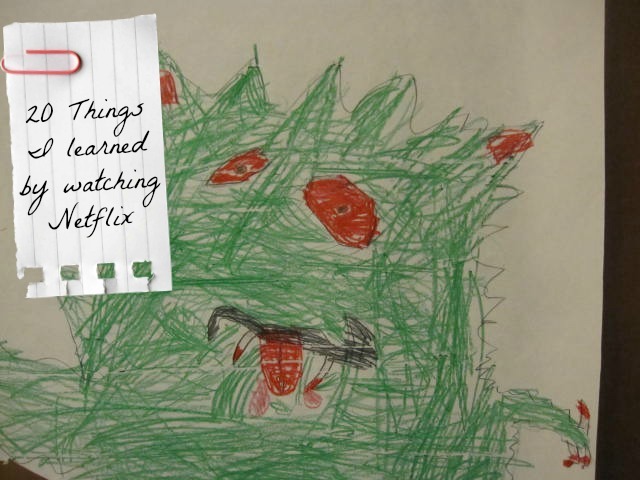 My kids love Netflix…I am a complete freak and never turn the tv on. I will watch if I am in the same room as my kids or husband, but I am always doing something else too. I know, very weird! I don’t think that’s weird. My husband doesn’t watch much TV at all. I’m usually watching by myself after the kids are in bed! That’s pretty cool! My youngest is really into The Walking Dead. Who knew you can learn so much? There’s so much information out there…that’s completely useless! 🙂 I enjoy this so much. You may have hit upon the formula for a successful post-apocalyptic story arch & elements. Thank you! I’m so glad you enjoyed it! I had fun making it up. I keep hearing people talk about Netflix and seriously was wondering what all the fuss is about. Believe it or not, I have never watched The Walking Dead, but Kevin loves it. So, I better not tell him that it is on Netflix or I may have a very obsessed Netflix fan on my hands with him! Seriously though, I too sadly can function 4 hours of sleep and still amazes me when I can do it and still keep going! I decided to get it because we don’t have cable, just regular TV. I was surprised that there aren’t that many movies to stream; I would have to pay for a DVD subscription. But there are a lot of cable show that I want to watch! With all that you do, I’m not surprised that you only get 4 hours of sleep! Enjoyed your video–did a good job with this! We’ve never tried Netflix. Thank you! I decided to try Netflix because we only have antenna TV, and now I can watch some shows I missed because they were on cable!